Climate change exists, right – can we agree on that? Agriculture faces a somewhat unpredictable future with higher temperatures amid shifting climatic patterns dictating what crops can and should be grown in which areas. It's a serious issue and the resultant changing face of viticulture is one hot topic at the moment of interest to the wine trade having both positive and negative effects. With rising temperatures drying out soil quicker, later harvest times and hot spells lasting longer than before, one of the main challenges facing many traditional wine production zones is the increased risk of crops dying or becoming spoiled. Indeed, as water availability becomes an ever more important factor, some vineyards in hot, arid areas such as parts of Australia and southern Europe have had to be pulled up and/or moved slightly further north, where the growing conditions are less extreme. In other areas such as Portugal, the rainy seasons are lasting longer. If this trend continues, then the global wine map will change with long-established winemaking areas becoming too hot and dry, or too wet, for their traditional grapes. Vasco Neiva Correia from DFJ Vinhos (double gold medal winner in the 2017 Berlin International Wine Competition and gold medal in the 2016 NY International Wine Competiton) based in Portugal comments on how the greenhouse effect has affected them, "The weather in the Lisboa wine area for the past 5 to 10 years is milder, with more constant warming between June and September. We have a problem during April and May when the conditions for pollination are very unstable. The rains after the equinox continue. So you need to work with short or medium cycle clones. Additionally you need to be prepared for machine harvest if necessary due to the increased rain." Conversely, global warming is allowing areas of the world previously considered too cold or harsh for winemaking, such as parts of the UK, to become the new "cool climate" wine zones, widening the limits of viticulture towards the edge of or outside the traditional growing latitudinal bands of roughly 30°-50° north and south of the equator. Even Sweden, never previously associated with a wine industry, now has several vineyards along its southern coast! Global warming coupled with greater climate variability undoubtedly makes life much more uncertain for vine growers. Rain during the crucial flowering period can be particularly destructive and one of England's leading sparkling wine producers, Nyetimber, famously abandoned its 2012 vintage after a disastrous growing season which included the wettest June and coldest summer since records began. A further danger, particularly for cooler climate countries like the UK, is that earlier budding as a result of warmer temperatures makes grape shoots more vulnerable to spring frosts, which along with wet flowering in June and poor fruit set conditions can reduce potential yields. Thus site selection and air flow management through the vineyards remain critical to reducing the risks of damage. Southern England is home to the majority of British vineyards and one trend is that a few winemakers here are growing new varietals like Albariño and Sauvignon Blanc, rather than grapes such as Reichensteiner and Dornfelder previously regarded as much better suited to northern European cool climate zones. This is in addition to further plantings of the "holy trinity" of sparkling wine grapes - Chardonnay, Pinot Noir and Pinot Meunier - the mainstay of England's growing reputation for producing world-class sparklers that now represent 66% of wine produced in this country. Furthermore, the relevance of global warming for English wine can be seen by the fact that growing season temperature, measured between 1989 and 2013, in south-east and south-central UK is similar to that of Champagne between 1961 and 1990 (Nesbitt et al., 2016)1, the two areas sharing a similar soil profile too. Therefore, with grape varieties considered more marginal superseding the hardier, dominant Germanic cultivars traditionally planted, vulnerability to climate variability has increased as a result. So, how viable are these new grape varieties and where should we look to find some real success stories and perhaps a few pointers to the future? 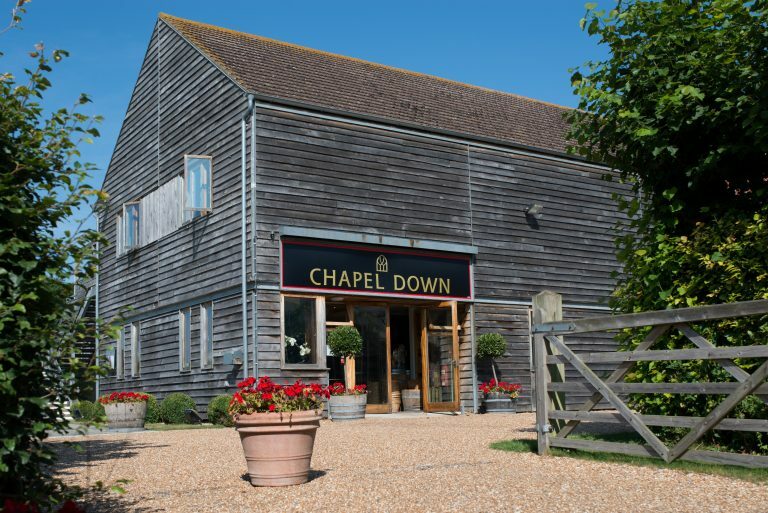 One business at the forefront of English wine's success is Chapel Down, whose wines are among the first from the UK to be exported to the USA (Three Graces, Rosé Brut and Vintage Reserve Brut). Owning vineyards in Kent, as well as sourcing fruit from across the southeast of England, the company's innovative approach has seen it improve sales year on year, becoming the UK's largest wine producer and gain global accolades for both sparkling and still wines. Among their pioneering achievements, they have produced England’s first single varietal Albariño, launched the country's first skin-contact white wine, produced the most expensive bottle of English sparkling wine at £5000 and broken the world record for the largest and fastest equity crowdfund in 2014. Winemaker Josh Donaghay-Spire shares his views on which grape varieties are currently best suited to the English climate. "We have gone from having predominantly Germanic varieties to Chardonnay and Pinot Noir now being our two most widely planted cultivars, so I feel we have already come a long way in discovering what suits our terroir. Bacchus is in third place with more being planted as it suits our climate very well. These three varieties are the ones we are focussing on, but additionally, we are expanding our areas of Pinot Meunier and Pinot Blanc, both of which can thrive in the UK. Moreover, we are replanting older vineyards previously home to Germanic varieties with Chardonnay and Pinot Blanc. We have also trialled some as yet unnamed varieties on an experimental basis which may work in the future but again, it is rather early to draw conclusions from these trials. Albariño is a fun project and a variety which I feel lucky as a winemaker to experiment with, but it is still marginal in the UK climate. It ripens with high acidity, so we would need to see a longer growing season or a rise in temperature before this becomes viable on any scale." Hybrid grape varieties are often used by UK wine producers, but for Donaghay-Spire, this is not an approach generally favoured at Chapel Down. "We find that the best wines are made from vitis vinifera vine stock, which is why we aren’t planting and generally don’t use hybrid varieties. As our experience grows, we are able to better select and manage the best clones and rootstocks of our preferred varieties. This will give us the highest level of disease resistance, which has always been the major advantage of hybrid varieties, whilst making the best quality wine possible." Since 1960, the UK has seen warming occur faster than the global average and post-1910, the seven warmest years have all occurred since 2002. Additionally, southeast and south-central UK have experienced a rise in temperature during the crucial April/May grapevine growing season and October harvest period conditions have become both warmer and wetter, bringing the potential for increased disease pressure (Nesbitt et al., 2016)1. At Chapel Down, they have to protect their vines from both powdery and downy mildew, in particular. They also use canopy management techniques such as shoot thinning, trimming and bunch zone leaf removal to manage canopy density and to reduce humidity around the fruit, helping to reduce the risk of botrytis rot. Donaghay-Spire sees better knowledge of terroir as key to improvements in UK winemaking, in addition to any effects of global warming. "Historically the majority of vineyard owners happened to have some land and then wanted to plant a vineyard. Now the industry is more informed and better resourced to plant only the very best viticultural land, which is vital when working on the leading edge of where grape growing is viable. The North Downs in Kent is one of the warmest places to grow grapes in the UK. This combined with south-facing chalk slopes at a reasonable altitude meant that, of our potential land targets, this was top of the list. Any climate change will affect broader areas more or less equally so higher temperatures will just make this region even warmer." With flowering in UK vineyards now occurring earlier than 1970-1990s levels, a shift attributed to rising temperature (Nesbitt et al., 2016)1, a lengthening growing season presents problems for viticulturalists, including late spring frosts, mildew, hailstorms and rain. However, the flip side is a likely improvement in sugar and/or phenolic ripeness. Donaghay-Spire explains further: "In 2014, we had a very warm spring and consequent early budburst, which meant that despite having a large crop, it ripened fantastically because we effectively gained two to three weeks at the other end of the season." Hattingley Valley is another leading English vineyard and is now also exporting three of their sparkling wines to the USA – Blanc de Blancs, Classic Cuvée and Sparkling Rosé. Winemaker Emma Rice shares her thoughts on why, despite higher temperatures, it remains difficult to make predictions about the future, especially when spring frosts can hit with a vengeance. "Although for sparkling wine, you need under-ripe grapes, in some years they may still not ripen enough. The 27th April last year devastated much of our Chardonnay and some of our Pinot Noir too. Our buds were only a few days old yet, despite using hot air blowers in the vineyard, we lost a large amount of our Chardonnay due to the freak Artic winter chill." (The south of England was not the only wine-producing region in Europe to suffer then, as Burgundy, particularly Chablis, suffered the worst freeze since 1981.) Rice also offers a note of caution regarding the viability of alternative, 'warmer climate' grape varieties: "As Chardonnay can be difficult to ripen each year, other grapes such as Sauvignon Blanc may prove even more of a challenge in the UK." Linda Howard of Suffolk vineyard Giffords Hall has seen how climate change has had an effect on the grapes planted in her region, one of the driest in the UK. "I do think that there are many varieties being planted in East Anglia now that would never have been attempted even seven years ago, Chardonnay and Sauvignon Blanc being two that would previously have been regarded as too difficult to ripen. Bacchus tends to prefer dry conditions, though it is vulnerable to frosts." Richard Bampfield MW similarly notes how grapes have benefited from warmer temperatures in England, but explains how this only shows part of the picture. "English grape growing is mature enough for soils and exposure to be taken into account, as well as temperature and rainfall averages. Chardonnay and Pinot Noir certainly ripen more consistently than they used to in the UK, but there remain big differences between counties. For example, it's quite possible we will see more vineyards in East Anglia, but it is a flat region and therefore vines are particularly susceptible to damage caused by sudden rain." He stresses how the effect of climate change on wine making is not just about growing temperatures. "It's the extremes that are difficult to manage, in other words, more drought combined with extreme heat plus heavier rain and snow. This is something we need to plan for, especially given the worse conditions seen elsewhere recently." So, given the difficulties in predicting the effects of future climate change on English wine, what we can we expect in years to come? Bampfield believes that the immediate to medium term future points to a greater focus on those areas which are already performing well and producing good grapes, citing the south of England as still containing plenty of suitable sites. "There is a contrast between professional, commercial enterprises like Chapel Down and Hattingley versus the amateur grape growers. In the first case, the major players will feel that there remains huge potential in their existing and successful geographical areas. On the other hand, with amateur grape growers boosted by the success of English wine, we can expect to see many small vineyards across the country, including further north, as we are already seeing in the West Midlands, for example." One trend certain to continue is the dominance of sparkling wine. While two Champagne Houses have already bought land in the south of England, Rathfinny Wine Estate in Sussex will soon become one of the largest single vineyards in Europe, specialising in sparkling wine, the first bottles of which are due for release next year. However, demand for English still wine, whether white, rosé or red may benefit from the trend towards light-bodied, lower calorie, lower alcohol drinks. Even with climate change, the UK still has more cloud cover and less sunshine than other major European wine-producing nations and so can continue to offer 'naturally light' wines with less alcohol, in addition to other styles. Both vitis vinifera and hybrid grape varieties have their place and, as Bampfield points out, perhaps the best grapes for the English climate are yet to be determined. Now is an exciting time for English wine making. Despite the unpredictability of climate change, the future looks rosy and UK winemakers are in optimistic mood. For Donaghay-Spire, Chapel Down is perfectly positioned to remain one of the country's top wine producers. "We are the largest wine producer, sourcing from over 20 different vineyard locations, a number which is set to increase. Our wealth of site selection experience combined with the wide geographical area over which the vineyards are spread puts Chapel Down in a strong position with regards to possible risk from increasing climate variability." Clearly, the vagaries of the British weather can throw up all sorts of challenges for English viticulturalists and climate change provides yet more factors to contend with. However, companies like Chapel Down, Hattingley Valley and many others are undoubtedly showing the way forward with their choice of vineyard sites, grape varieties and wine styles that allow them to compete successfully with top wine producers from around the world. Nesbitt, A., Kemp, B., Steele, C., Lovett, A., and Dorling, S. (2016) Impact of recent climate change and weather variability on the viability of UK viticulture – combining weather and climate records with producers' perspectives. Australian Journal of Grape and Wine Research, 22: 324–335. doi: 10.1111/ajgw.12215.